These lovely little coffee mug crocheted key chains are the perfect little gift for coffee lovers. This is a quick and easy amigurumi project that you will have done in no time at all. The designer behind this fun coffee mug key chain pattern is Sarah over at Repeat Crafter Me. Sarah has written a great crochet pattern with a mini photo tutorial included. The coffee mug key chains are started using a magic ring. Not familiar with using the magic ring? Here is a great video tutorial: Crocheted Magic Ring [A How To Tutorial]. She has also written a great pattern for some super cute coffee mug coasters. You can find the pattern the coasters here: [FREE Pattern] Crochet Coffee Coasters. 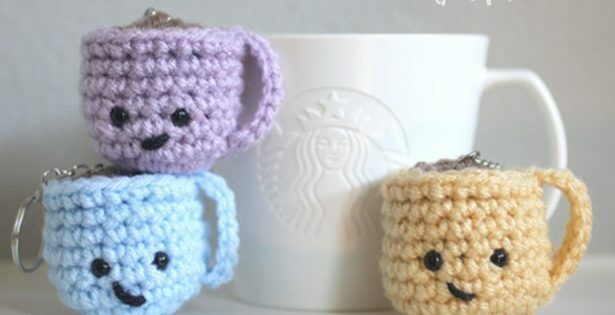 You can access the FREE pattern for these fun crochet key chains looking like little coffee mugs from Sara’s website.